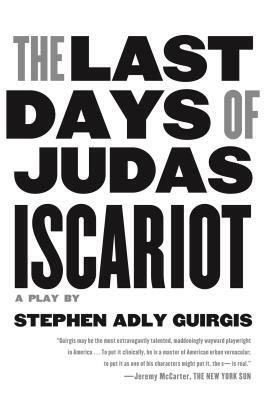 The Last Days of Judas Iscariot: A Play (Paperback) | The Drama Book Shop, Inc.
Set in a time-bending, seriocomically imagined world between Heaven and Hell, The Last Days of Judas Iscariot is a philosophical meditation on the conflict between divine mercy and human free will that takes a close look at the eternal damnation of the Bible's most notorious sinner. This latest work from the author of Our Lady of 121st Street "shares many of the traits that have made Mr. Guirgis a playwright to reckon with in recent years: a fierce and questing mind that refuses to settle for glib answers, a gift for identifying with life's losers and an unforced eloquence that finds the poetry in lowdown street talk. [Guirgis brings to the play] a stirring sense of Christian existential pain, which wonders at the paradoxes of faith" (Ben Brantley, The New York Times). Stephen Adley Guirgis is an actor and playwright. A member of the LABrynth Theater Company and the MCC Playwrights Coalition, Guirgis is the recipient of new play commissions from South Coast Repertory and The Manhattan Theatre Club. He is the author of the plays Our Lady of 121st Street, Jesus Hopped the A Train, In Arabia, We’d All Be Kings, and The Last Days of Judas Iscariot, all published by Faber. He lives in New York City.